Summary: Good updated American cuisine at this brand new spa. We went to Solbar on a Sunday night in July 2007. 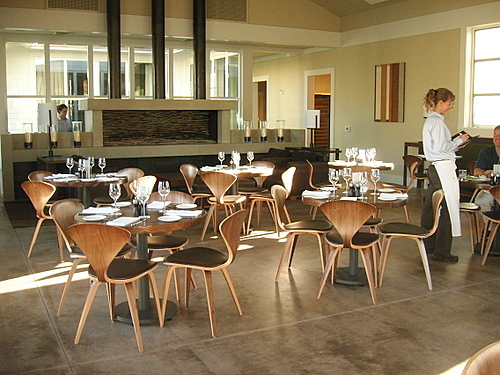 The restaurant had opened the previous Thursday. I don't usually like going to restaurants when they first open; I figure they need to iron out their quirks, but I was intrigued by the notion of being the first to write a review for the restaurant. So here it is. 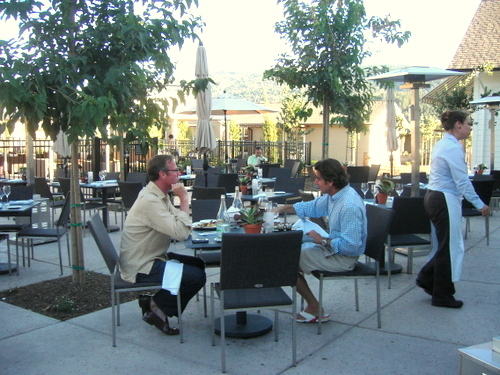 Solbar is the restaurant of Solage Calistoga, a very new resort in that city. It's so new that while open, it's still being built - though I hear the guests are not given discounts from their $400-and- up rooms to put up with construction, but that's neither here nor there. The restaurant managed to be mostly filled on a Sunday night. We were there around 7 pm and secured a table by the pool, but by 8 pm you couldn't be so choosy. The restaurant itself is very striking. Inside, a very modern and dark room awaits you. 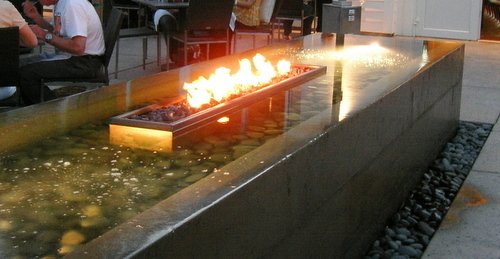 Outside there is a comfortable patio featuring a water fountain with a fire pit. There are also modern couches to rest on while savoring a drink. Because of its location at a spa, clothing can be quite casual. 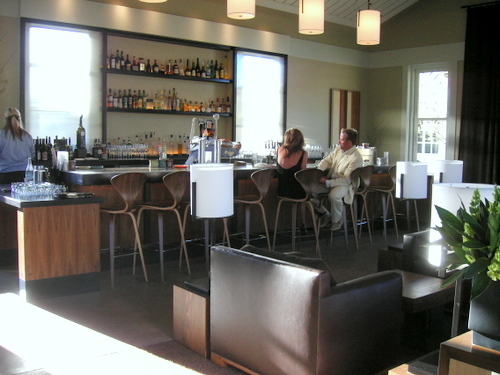 The menu offers re-inventions of American classics with the chef's own flair. They are very rich and not at all related to the "spa cuisine" of yesteryear. Perhaps unwisely, Mike and I decided on the "sliders" - mini bacon cheeseburgers - ($12 for 2) as an appetizer, while I had the short ribs ($24) and Mike had the smoked spare ribs ($22). As I said, American classics. Dinner started with bread and whipped salted butter. 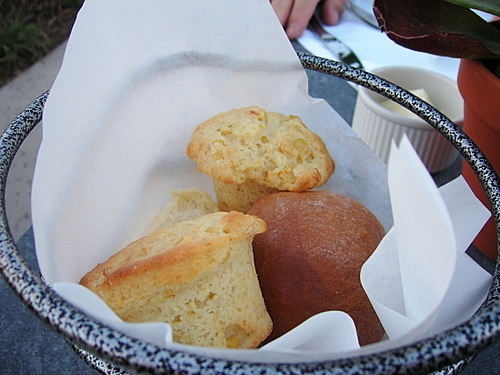 The bread included a pedestrian bun and a pretty good corn muffin. I had an extra one of those. The sliders were very good. I liked the crunchiness and smokiness of the bacon and appreciated the fact that it wasn't overbearing. The sweetness of the caramelized onions provided a good contrast in texture and flavor. However, this is not really an appetizer sort of dish, and it's probably best enjoyed with a salad. 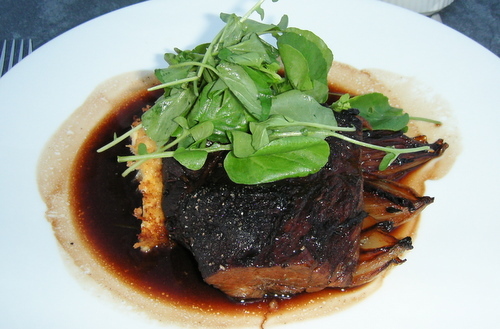 The short ribs, cooked in a wine sauce, had a classic, robust taste. I found at points that it was a bit bitter and I'm not sure it went that well with all the wine tasting I had done earlier that day. I felt at first that the portion was on the small side, but I was quite satisfied by the time I finished it. It came with the most unbelievably delicious polenta I've ever had. It was crispy on the outside, creamy in the inside, and perfectly seasoned. I'd order the dish again just to be able to savor the polenta once more. It was just perfect. 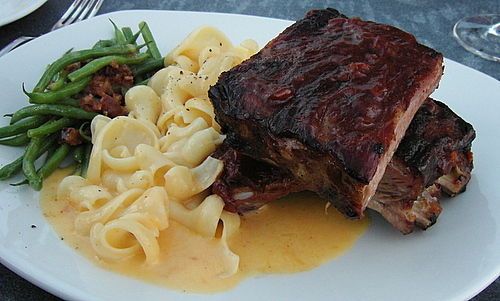 Mike's spare ribs were also great. They had a subtle smokey taste, and were fall-off-the-bone tender. He liked his green beans; they had a tang to them and pieces of bacon. He was much less enthusiastic abut the macaroni and cheese. He felt it was just OK, nothing special. Mike had a glass of their Cabernet with dinner. He liked it better than most of the cabs we had been tasting that day. It had a buttery fragrance, a good amount of tannins and a smooth finish. Desserts (all $8) are also takes on traditional American desserts. They didn't sound greatly appealing to us but we wanted to give them a try. 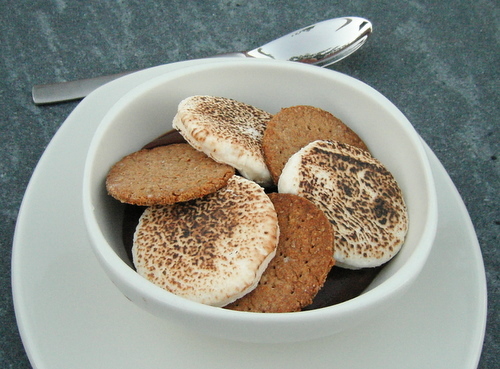 We decided to share the chocolate pudding with graham crackers and marshmallows, the Chef's own take on the s'more. We felt he completely failed, if you are going to re-invent something then you need to make it better than the original (and, of course, it's hard to top a s'more). The pudding lacked chocolate flavor, it reminded me of the Belgian chocolate pudding available at Trader Joe's, but it wasn't nearly as good. The graham cracker wasn't particularly tasty and the flavors didn't really blend. It was also a pretty difficult dessert to eat, as the crackers were very difficult to break. On the plus side, the portion was large enough to share. Service was very good, the wait staff were clearly making an effort to make a good first impression. They were friendly and professional, and they helped us have a good time. On a final note, I should say that, again, because it's at a resort, Solbar is kid friendly. We didn't see any really small children having dinner, but they were around and I'm sure there will be more of them coming. In all, our dinner at Solbar was very nice, and I would return again.